Cumbrians are no strangers to getting fit outside. A Parkrun exists in many towns across the county, including Barrow, Workington, Penrith and Windermere. 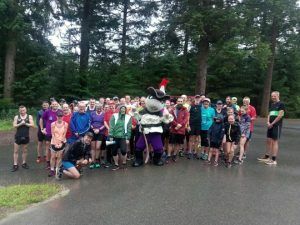 Cumbria is also well known for its fells, and Forest Enterprise England, which manages Whinlatter Forest wanted to create a Parkrun with a difference. The Whinlatter Forest Parkrun received £2,500 from the Quarry Hill Fund and Cumberland Building Society Charitable Foundation to set up the 5km Parkrun and cover the initial costs, such as barcode scanners, timing devices, high viz jackets, and volunteer expenses. Launched in January 2018, participants have already named it ‘Beauty and the Beast’ as runners not only take in breath-taking views of the Lake District National Park, they also climb a whopping 210 metres of ascent. The average weekly attendance is almost one hundred and more than 170 clubs and groups have already taken part. One of the original core volunteer team, who helped set up the event, was diagnosed with anxiety. His GP prescribed running and physical activity as a way of coping with it. He stopped volunteering and started running every week. Week by week his confidence and mental health improved and he seemed increasingly stronger and more able to cope with day to day activities. 4 months later he was back to being his usual bright, confident self. He still runs the route and volunteers once he has finished. He also encouraged his wife to run the course and now she is a regular volunteer too. As well as the physical and wellbeing benefits, the project is also benefitting the local economy as people stay to enjoy a coffee and bacon sandwich in the café after the event. It is also attracting a large number of Parkrun tourists, who stay in the local area the night before or on the day of the event.